Hajos Hungary pictures, photos. Images of the Holok wine cellars to buy on line as stock photos or photo art prints. 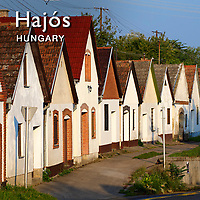 Hajós's name comes from the Hungarian word "hajó" which means boat or ship. It is possible that in the Middle Ages Hajós was surrounded by a large area of water. The medieval Hajós lost much of its population during the Ottoman conquest. The bishop of Kalocsa moved German immigrants to Hajós which received village rights in 1756. There are over 1,200 press houses built in village structure. The taste of the ripening fiery wine in the coolness of the cellars are offered by this region. This is the place where every stranger deserves a "Grüsgott." On the rich blooded Urban day wine festival, tens of thousands of people celebrate Saint Urban, the guardian of grape growers and wine makers.